Recently, I had to review a bunch of proposals. In reading these, I saw a number of instances where the wrong word was used. This wasn’t a case of word choice, but a typo that a spellchecker didn’t flag. People had omitted letters or transposed characters. Think of people using “manger” instead of “manager”. These are tough errors to find as we tend to skim over these when proofing our own work. One way to solve these issues is to use an exclude dictionary file in Microsoft Word. Microsoft Word allows three different types of dictionary files. 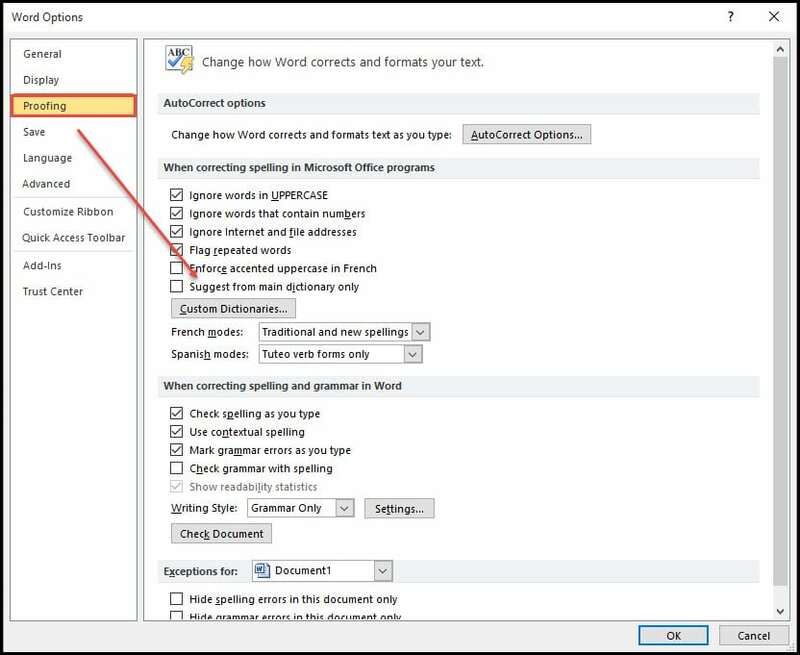 Custom When you click Add during a spell check, that word is added to the default custom dictionary. You can also buy industry specific custom dictionaries. Exclude Exception file of words, which prompts the spell checker. These entries override the main dictionary. A second set of words are situational. For example, you’re a businessperson dealing with Myanmar. In some cases, you may wish to use “Burma” or vice versa. You don’t always use one term over another. If you did, AutoCorrect would be a better solution. Another case might be copywriters who need to switch between British and American spelling based on the client. Unlike the main dictionary, the words you place in this exclude file prompt Word’s spell checker. The idea is you’ll look at the flagged word, put it in context, and catch a potential mistake. From the Word Options dialog, click Proofing tab. Click the Custom Dictionaries… button. The Add Custom Dictionary dialog should show with a listing of your dictionaries. Notice the group that starts with ExcludeDictionary. You may also have several languages displayed.In the snap below, I have English (EN), Spanish (ES) and French (FR). If you glance at the snap, you’ll also see I have four EN files. So, how do I know which one to use? It’s not intuitive and you’ll need to get the decoder ring from Microsoft. The last 4 characters after the language code are called the Locale ID code. If I glance down the Microsoft chart, I can see the entries for English. Based on the chart, I know the file I need for the US has “0409” in it. Obviously, your code may be different based on your location. Once you’ve found the exclusion file you need, note the name. Click the Cancel button. Sad but true, you can’t edit these files in Microsoft Word. You’re now ready to add words to the exclusion dictionary. There are a few rules. You can’t have spaces. No phrases are allowed. You can’t have a word exceed 64 characters. In earlier versions, I read you couldn’t use uppercase letter but I was able to enter Burma and Myanmar in my file. The file is pretty easy to edit, but you’ll need a text editor like Notepad, Sublime text, WordPad, Notepad++ and so on. Basically, a program that doesn’t add styling. Open your.lex file in your text editor. Add one word per line. Each line should be a word you want Microsoft Word to add a squiggly line underneath to catch your attention. In the list above you can see where I’ve used words that have different spellings. In some documents, I need to use the US spelling, but not others. By adding these words, I’m telling Microsoft Word to flag them so I am prompted to think about the context. Start Microsoft Word and do a test paragraph with your exclusion words. For each word on your test paragraph, you should see the red squiggly line. Edit the .LEX file as necessary.